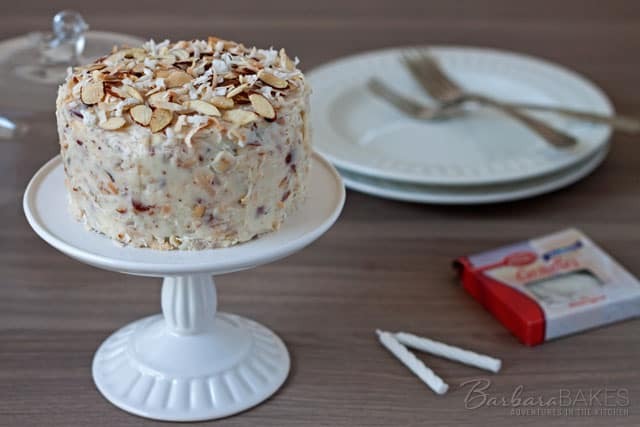 A rich, delicious little four-inch chocolate cake filled with a luscious, creamy coconut almond cream cheese frosting. 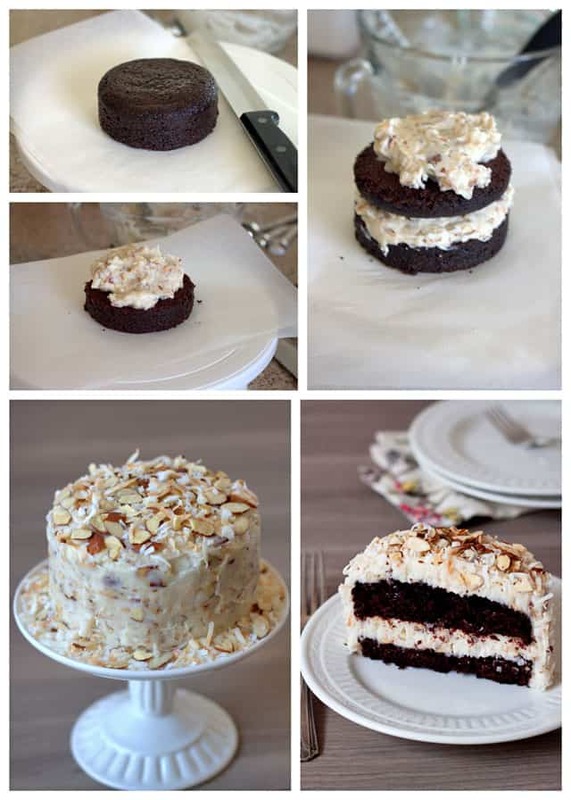 When I made the Triple Layer Chocolate Cake with a Coconut Cream Cheese Filling for my grandson’s birthday, my husband loved the coconut cream cheese filling so much that he said I should make a cake frosted with the filling too. So for his birthday, I made him this cute little chocolate cake for two with coconut almond cream cheese frosting between the layers and coconut almond cream cheese frosting on the outside of the cake. 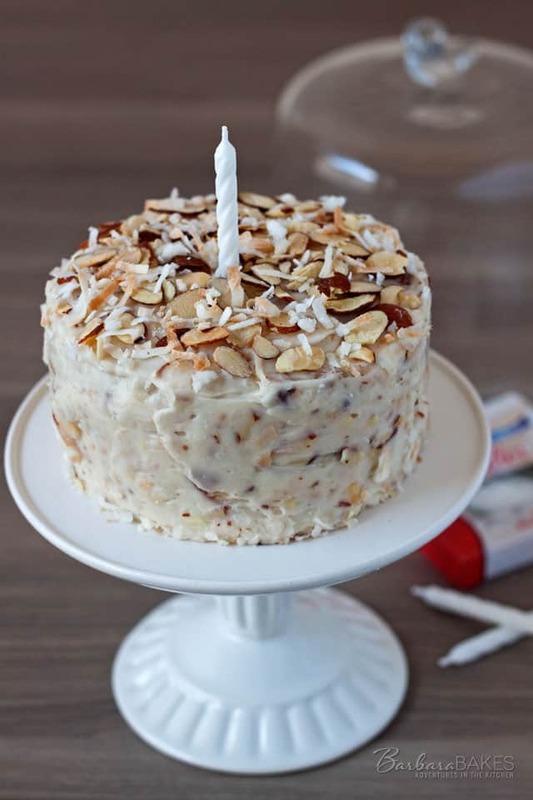 I finished his luscious little cake with additional toasted coconut and sliced almonds on the top of the cake. My husband loved his cake for two. The frosting tastes like a no bake coconut almond cheesecake which pairs perfectly with the chocolate cake. If you’re not a fan of coconut or cream cheese, hop on over to my Cherry Chocolate Cake for Two post. 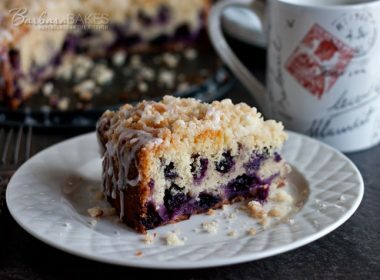 They’re easy to make cakes that are perfect for those times when you want something sweet but you’re not feeding a crowd. Preheat oven to 350°. Spray a 4" x 2" round cake pan with non-stick baking spray. 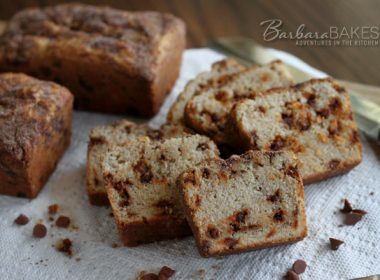 In a small mixing bowl, whisk together flour, sugar, cocoa powder, baking soda, and salt. In a small cup, whisk together water, oil, vinegar, and vanilla. Add wet ingredients to dry ingredients and mix just until blended. Bake 18 - 20 minutes or until a tester comes out clean. Allow to cool completely on a wire rack before frosting. Beat together cream cheese, coconut oil, sour cream, and vanilla until blended, scraping down bowl as needed. Beat in confectioners' sugar until smooth. Stir in cooled toasted coconut. Cut the cake in half horizontally and evenly spread one third of the frosting on the bottom half, carefully stack the top half on top of the frosting. Frost the top and sides of the cake with the remaining frosting. Decorate with additional sliced almonds and coconut, optional. Refrigerate until ready to serve. Made this today for a friend. It came together quickly and it was so cute and super easy. Thank you! Oh, wow. Cake for two. I should invest in this size cake pan. My son is moving away, and it will be only the two of us. The frosting sounds amazing. This is such a sweet idea! I cant believe how lovely and moist your chocolate cake looks – yum!! That’s such a great idea. 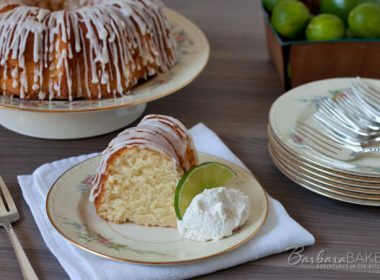 I’ll have to try one of these, because enough cake for two is probably just right for just me! Omgosh this is so wonderful! I’ve always wondered why there aren’t more receipes like this for people who don’t have the need for a full size cake. 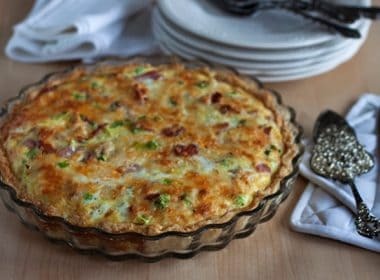 Will most definitely bake this! Cake for two is exactly what we need. I always have to give it away or toss it out and that’s just nuts. I love the chocolate and coconut and cream cheese combination. So adorable and beautiful! That frosting is totally irresistible, Barbara. 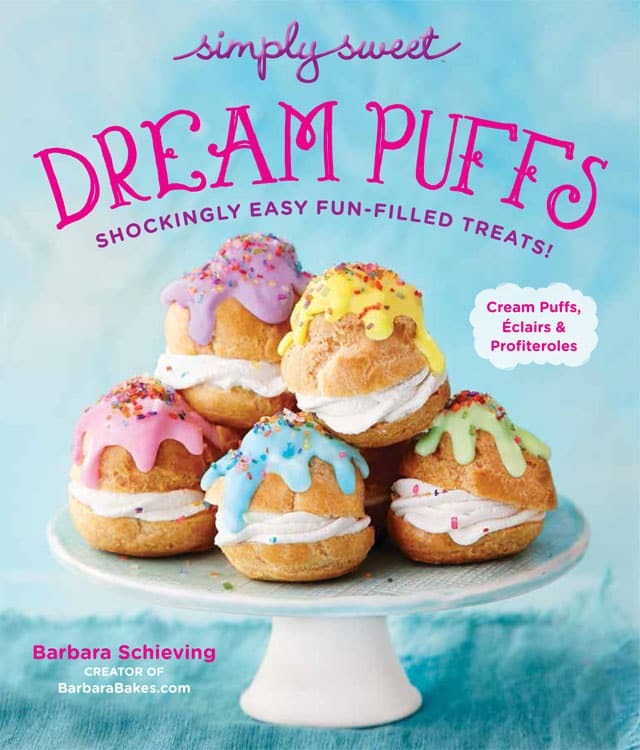 Hi, I signed up for this because it looks great and I love baking too! I live higher than you (about 7000) and I am wondering if your recipes are what you use at your altitude or sea level. Thanks a lot! 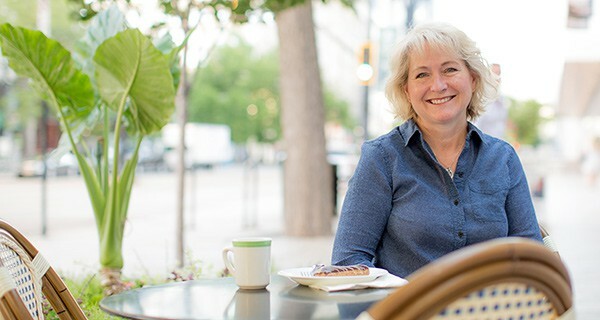 Thanks Lynn – my recipes are what I make at my altitude, about 4,000 feet. If I’ve adjusted a sea level recipe for my altitude, I generally try to note it. 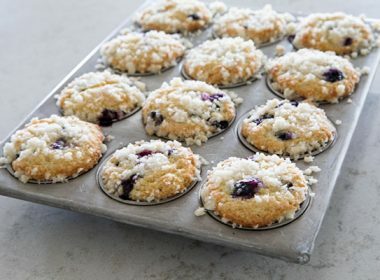 Here’s a link to a guide I like to use to adjust recipes http://cityhomecountryhome.blogspot.com/2010/08/high-altitude-baking-and-candy-making.html. At my altitude I don’t always need to adjust a recipe, but I’m sure at yours most recipes could be improved by tweaking them. Enjoy! I love this! While it is easy for me to get rid of excess cupcakes/cakes/cookies at work it’s nice to be able to whip up just enough for two. Love the frosting. Cutest little cake ever. I made the cherry chocolate ones yesterday for my daughter, her hubby and granddaughter. Now have to share the recipe with her because her husband loved it. So my next one will be this one. I think that chocolate cake recipe could stand on its own even with just powdered sugar sprinkle. Such a neat idea to make mini’s. What a cute little cake! That frosting sounds divine. Boy I like the way your husband thinks….that is one delicious looking cake. Perfect for us….just enough for a special treat. So cute and tempting! A great combination of flavours. Wow – I’ve never thought of flavouring my filling (mad to come to think of it!) and I love coconut – this looks brilliant!